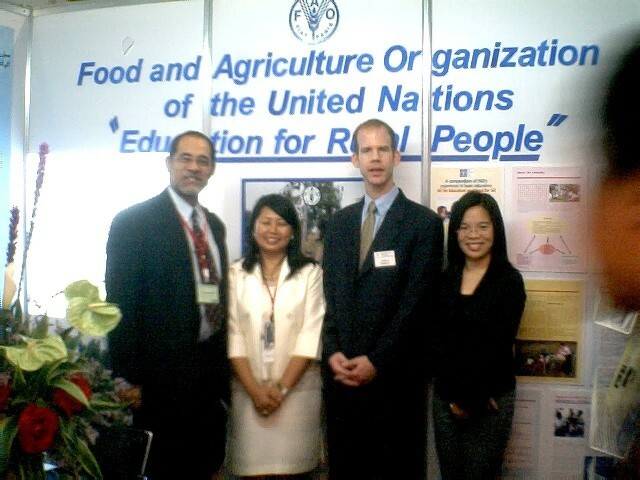 The workshop on Addressing Learning Needs of Rural People held in May 2004 in Bangkok, is the Education for Rural People Flagship’s most recent effort in Asia to promote action towards meeting the educational needs of rural people. The workshop brought together two participants from each of the nine participating countries (representing each country’s Agriculture and Education ministries from each country - Cambogia, China, Indonesia, Laos PDR, Malaysia, Mongolia, Vietnam, Philippines and Thailand), and twenty other participants representing international organizations, non-governmental organizations, and academia. The workshop was organized jointly by FAO (SDRE, Rome and Bangkok Regional Office), UNESCO (IIEP and Bangkok Office) with the support of Italian Development Cooperation (DGCS). •	Explore ways of promoting partnerships (including inter-sectoral cooperation) at all levels to address concerns of rural people within the framework of Poverty Reduction, Food Security and Rural Development strategies as well as EFA strategies. How Are Some Asian Countries Addressing the Learning Needs of Rural People?